Sitting in India, we keep hearing a lot about Dubai. Dubai is often mentioned in the Hindi movies, Indian newspapers and TV channels. I had also heard a lot about it from friends and relatives who visited the place. The malls in Dubai, the gold bazaar, the show of wealth everywhere are some of the topics often discussed by people who have visited the place. Some people like it for these traits while others hate it. I had started developing some sort of curiosity towards the place. When our visit to Greece did not materialize, I suggested that we go to Dubai instead. It is true that to understand the pulse of a place, one must visit the place and get to know its people. Although I knew a lot about Dubai through TV, newspaper, movies etc., still the experience was new once we landed there. One thing I noticed was that the place is a much disciplined one. It is an extremely rich place which is very evident everywhere – the buildings, roads, infrastructure, and malls. The country is very business friendly. It encourages everybody to go there and do some business. It is a Muslim country and the locals lead a conservative way of life. However, they are very tolerant towards all other cultures. In the malls, hotels and roads of Dubai, one finds people from all over the world. While staying in the hotel, I used to read the local newspaper. I learned a lot about the political situation in the Middle East in those three days. It was the time of the year when the 60th anniversary of “Catastrophe” was observed. It marks the event when the Palestinians lost their homeland to Israel. I did not know so much about the details of that particular historic event. The newspapers were full of various articles about the event, accounts from old people who went through that experience and about the refugees staying in Jordan and Lebanon. It seems the refugees (even the 3rd generation) haven’t got the citizenship in Lebanon. There are a lot of restrictions about what profession they can take up, where they can stay etc. Earlier I had a vague idea about the political line about Gaza strip and West Bank. It was an eye opener. 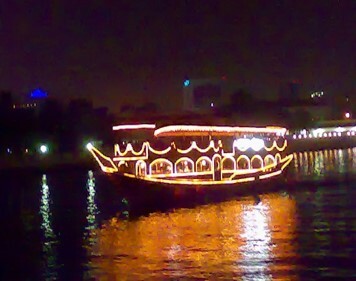 The night view of Dubai from the Dhow cruise was fantastic. Dhows are big steamers/launches on the sea. They are very nicely decorated with lights and look magnificent during night. One can get a fantastic view of Dubai from these cruises. All the landmark buildings of Dubai, the commercial districts, gold souk and even the Bank of Baroda building can be seen sitting on the deck of the dhow while enjoying dinner. Indian food like Biriyani, roti etc. are available everywhere along with noodles, burgers, soups etc. Food is not an issue at all while staying in Dubai. One day we went out for a city tour. The entire tour was conducted from an air-conditioned van. The reason being, it was above 40 degree outside. We went through a posh residential area called Jumeira, a place close to the sea beach, lined with beautiful bungalows. The tour guide informed us that the Arabs, who form only 20% of the total population of Dubai, are given free bungalows by the ruler of Dubai. The Arabs are given all facilities like free education, free health care services, guaranteed govt jobs etc. One cannot start a business in Dubai without having a local Arab partner. We passed through a tunnel under the sea, saw the seven star hotel (the only one in the world it seems; I have forgotten its name) and the highest tower in the world (Burj Dubai) as part of our city tour. At the end of the tour, we got dropped at the Emirate mall by our guide. The Emirate mall was like any other mall except for its magnificent size. The Ski Dubai was an amazing experience I must say. It shows what a rich country can do for the purpose of entertainment. A snow world has been created inside the mall where the temperature is -5 degree inside and 40 degree outside. It was a place Isha and Megha enjoyed immensely (although it is surely contributing to global warming). After coming back to the hotel, we headed to the desert for sand dune bashing in the late afternoon. The Philippines driver was waiting for us at the hotel lobby. We had no idea what the Sand Dune bashing was going to be. The SUV had GPS system installed. I was wondering why the vehicle has a GPS system. On our way to the desert, our SUV stopped at a place with some gift shops. I noticed that many other SUVs from the same tour company have also arrived. Then I realized that all the SUVs are going to go together to the desert. After all the SUVs arrived, we started again towards the desert. The landscape outside gradually started changing and sands started appearing everywhere. All of a sudden the SUVs stopped and the drivers started deflating the tyres. Later on I understood that it was done to increase the friction. At last we were in the desert. It was the first time I was seeing a desert! It is an amazing experience. Sand started appearing everywhere. There were huge sand dunes all over the place. It was like a sea of sand. 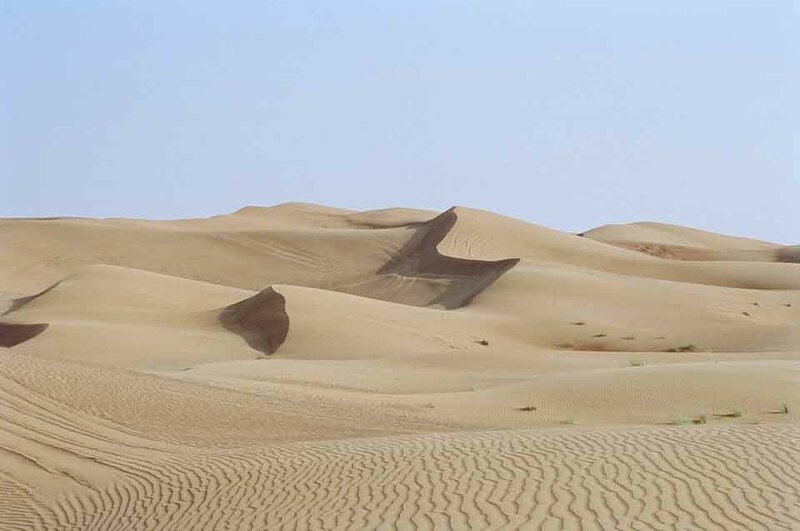 Our Van started climbing the huge sand dunes and descending at an extremely high speed. Megha got scared and started crying. To be honest, I was also very scared and waited for the trip to get over. I felt like throwing up. Some of the SUVs got stuck in the sand and kept hanging from the top of the sand dunes. A couple of them had to be dragged by the other SUVs with help of rope. Now I realized why the vehicles were using GPS system and why they were coming in groups. Our driver from Philippines was in his late forties. He mentioned that he is been doing this for the last 18 years! He seemed the most experienced and matured among all the drivers – a fact which made me feel a little more comfortable. I was relieved when we came down to the concrete road after almost two hours of our sand dune bashing. It was almost evening when we reached a Bedouin village. Of course it was not a real village. It was a village made for the tourists. But, yet, it was a nice place. There were camel rides, bike rides, open air dinners and barbecues – with nice chicken and lamb kebabs followed by belly dancing. It is almost a form of classical dance in that part of the world. We saw it everywhere – in Egypt and Turkey as well. It is quite a bold form of dance I must say, considering the conservative atmosphere of the Islamic countries. The Arab lady looked almost like a westerner, with her white skin and blonde hair. There were some men from other Middle East countries like Iran. They started clapping and dancing noisily. After sometime, an Iranian lady from the audience got up and started dancing violently. My whole idea about the conservative Middle East and other Muslim countries changed completely seeing her dance like that. In fact, we and a few other Indian families over there were trying to look here and there uncomfortably and visibly feeling out of place! It is only when you visit places like Dubai and Egypt that you realize how green your own country is. Greenery is one thing which we constantly missed during our visit to these three countries. While in Mumbai, I constantly feel that there is not enough greenery and mindless urban development is destroying the greenery. After coming back from this visit, I have started valuing our greenery and water source even more. One interesting trip was to the gold souk. It was our last day in Dubai. We were wondering how to spend the morning. I had heard a lot about the gold souk. Although I did not have any plans of buying any gold, I just wanted to visit the place out of curiosity. It was an experience worth having. Some of the shops are in modern style air-conditioned malls. But the actual fun is to be in the old part of the souk – which is the conventional type of open bazaar. There are shops on both sides of the road. The one thing which struck me was the security of the area. Huge piles of gold ornaments were hanging from the shops everywhere. Later on we learnt that the gold is exported from India and South Africa. It is cheap in Dubai since there is no tax to be paid in here. In the evening we were catching a flight to Istanbul, Turkey. We went to the airport which was one of the most glamorous airport in the world. One can spend several hours looking at the magnificent shops and other things in the airport. At the end of our 4 day trip, we were happy that we decided to visit Dubai.